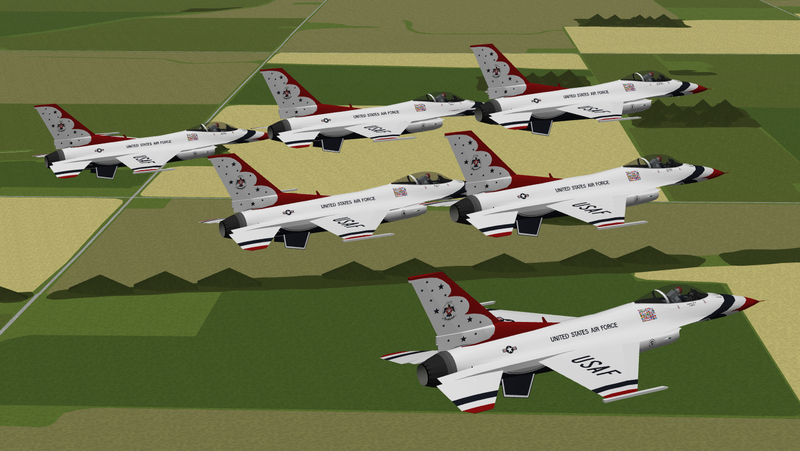 The YSFlight Thunderbirds are a virtual team that operates through YSFlight Simulator replicating the pride, precision and professionalism of the United States Air Force Air Demonstration Squadron. 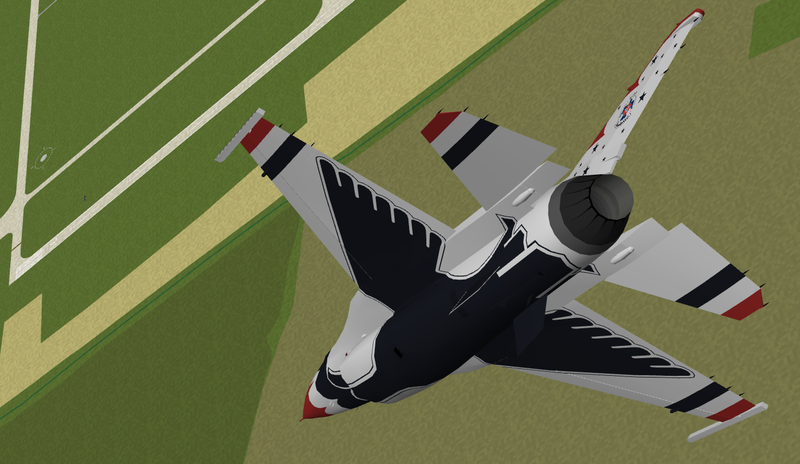 For the first time in the history of YSFlight aerial events, the YSTB are the first fully online team that replicates the product of the Thunderbirds. 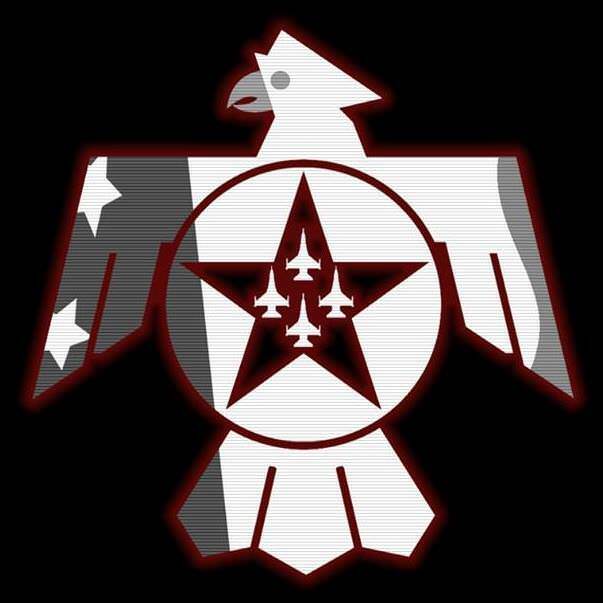 Every Friday and Saturday, these outstanding and talented individuals work vigorously to accomplish the YSFlight Thunderbird mission together with precision and expertise at every YS online event. 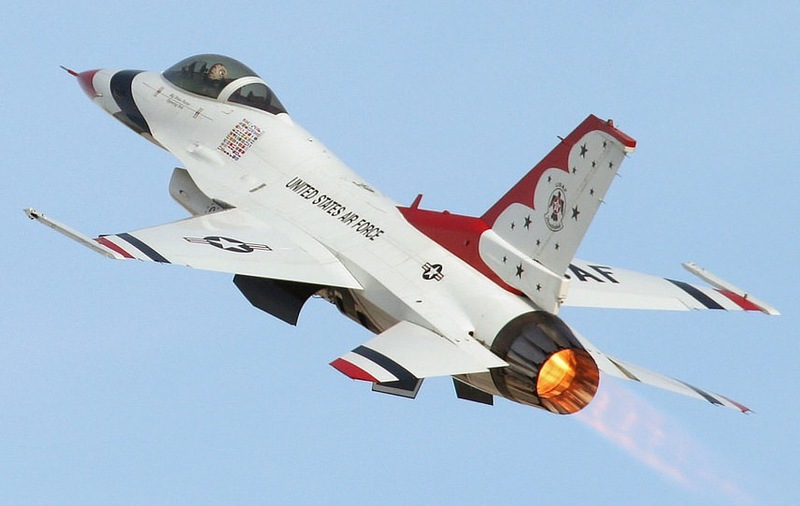 The aircraft flown in the Thunderbirds demonstration is the Lockheed Martin F-16C Fighting Falcon. This multi-role fighter has been used by militaries of multiple nations to find and attack enemy targets both in the air and on the ground. It's powerful Pratt & Whitney F100-PW-229 engine produces over 30,000 pounds of thrust. It can reach speeds in access of Mach 2, twice the speed of sound. The YSFlight Thunderbirds' demonstration is a performance consisting of various high powered, high G maneuvers, as well as precise and graceful formation maneuvers, throughout a 35 minute to hour long time period depending on remote or airport show site locations. Out of the main six pilots are four who make up the Diamond formation and their maneuvers. From flying only feet by another aircraft to executing simultaneous aileron rolls in close formation, they apply the exceptional and precise handling characteristics of the F-16 by performing towering loops and rolls maintaining close proximity. Throughout the thirty minute performance, they hold the ballet-like element of the show. The Diamond pilots showcase the end product that comes from dedication, precision flying, and commitment, aiming to perfect each maneuver they fly. Separated from the Diamond for nearly half the demonstration, the solo pilots utilize their aircraft to perform maneuvers at the edge of their operating envelope. Unlike the Diamond segments within the show, the solos posses more of a rock and roll element. They showcase what evolves from immense teamwork and professionalism, all while demonstrating the capabilities of the F-16 Fighting Falcon; an example of outstanding American quality aviation that has been the foundation of the United States Air Force since 1947. 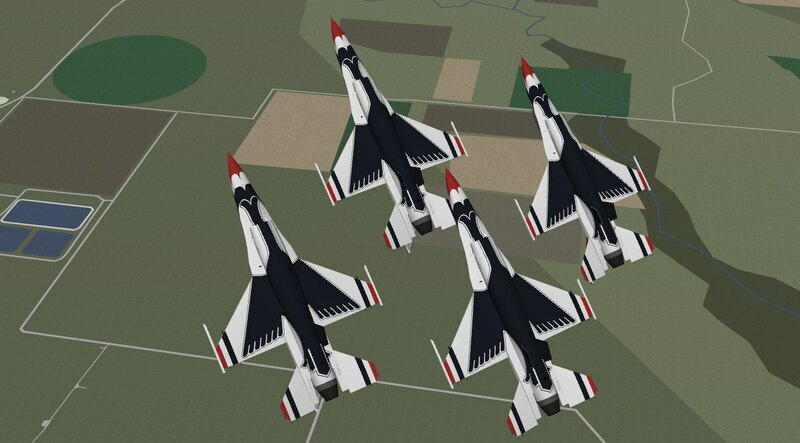 Combining the elements of both the Diamond and the Solos, the famous six-ship Thunderbird Delta formation takes the stage as resemblance to the final part of the demonstration. Adding more amazement into the sunlit spectacle, the Delta arcs through the sky reflecting months of training and preparation from each member, as they work together to perform such maneuvers swiftly and precisely. Any questions about the team or information on how to join us to be apart of next year's team? Contact us through our social media pages or visit us at https://ysflighttbirds.wixsite.com/ystb. Can't wait to hear from you soon and see you at the next YSFlight virtual air show! Last edited by Indy on Wed Jan 23, 2019 11:57 pm, edited 1 time in total. Reason: Removing personal information due to request.